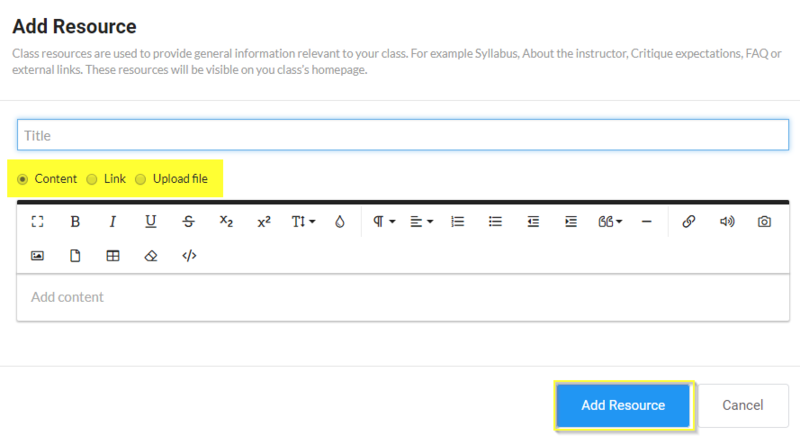 Share documents, links, or text content in 'Class Home' for easy access by the class. Class resources are used to provide general information relevant to your class. For example, you might include a syllabus, an "about the instructor," critique expectations, class FAQ, or external links. These resources will be visible on you class’s homepage. A resource can be a document, a link, or some text that you provide. Add your resource on the pop-up screen. You can choose content, a hyperlink, or add a file directly. Click the blue 'Add Resource Button' to complete. Please note that Wet Ink allows a maximum of 20 MB per file upload. If you have a larger file, you may want to use a third-party resource like Google Drive, Dropbox, or One Drive and simply provide the link. Per the 3-dot icon and choose 'Edit Mode.' 'Edit Mode' makes it easy to edit existing resources, change the order of existing resources, or delete resources. 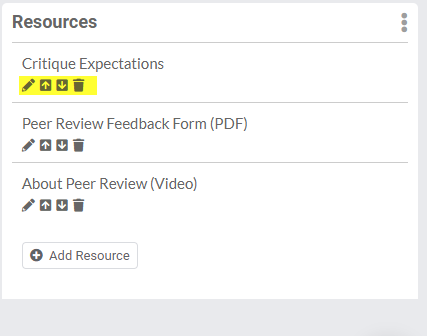 Under each resource, you'll see an edit icon, up and down arrows, or a trash icon to make these changes.